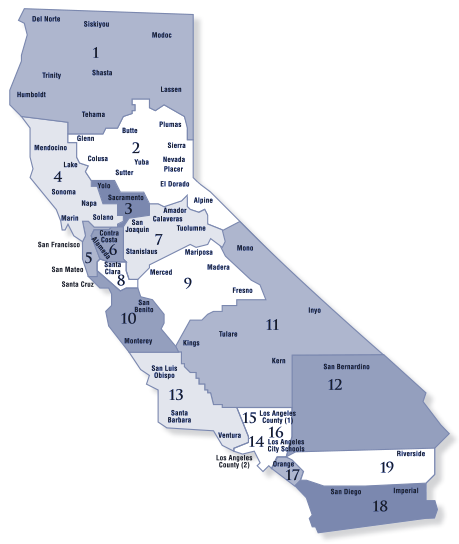 ACSA’s 19 regions divide the state geographically and provide valuable opportunities for professional involvement with administrators in nearby school districts. The regional structure allows your voice to be heard on education issues. Each region elects regional officers who also serve as the region’s voice at the statewide Delegate Assembly. In addition, regions elect a regional representative to ACSA’s state Board of Directors. ACSA regions offer networking opportunities, professional development workshops and programs tailored to meet local needs. Use the map below to find your region by area of the state and county.